Rejuvenate hair transplant centre Indore is one of those few hair transplant centres in India, where both FUT hair transplant and FUE hair transplant is done with the equal good result. Rather this centre is specialized in doing mega and giga sessions of more than 5000 grafts by a combination of FUT, FUE and body hair transplant. But the biggest question in the mind of every person going for the hair transplant is “what method should be preferred and why, especially in a young patient with an advanced grade of baldness”. In all patients donor area of the scalp is limited; it is like a bank FD which should be used judiciously when needed. Young patients are in the stage of progressive hair loss, they may need more sessions of hair transplant in the future. For maximum utilization of the donor area, an experienced surgeon who is well trained in both FUT and FUE will prefer to do first FUT hair transplant. Now if a person needs hair transplant in the future remaining donor area is virgin and we can do hair transplant by FUE if he needs more coverage or wants to improve density beard and chest hair can be used subsequently. So if a person goes as per surgeons experience and advice, maximum utilization of the donor area can be used, and he may get a head full of hair again even in Grade VII baldness and limited donor area. 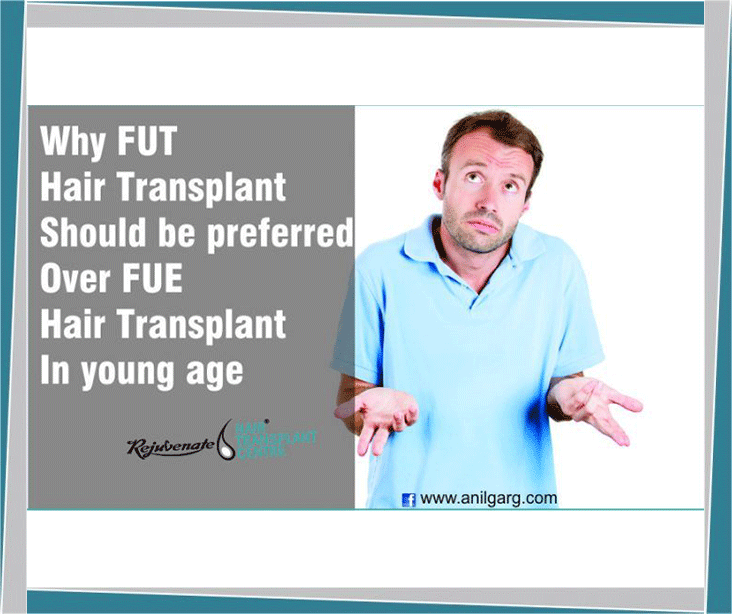 So the plan of the number of grafts and type of technique FUT vs FUE should be customized according to the need of the patient. FUT is more demanding surgery and needs to be trained surgeon for strip excision and trained technicians for follicle dissection under microscope, very few centres have these trained staff and surgeon. So these centres prefer to do FUE and a false belief is created in the mind of the general public that FUT is an old technique, causes lots of pain-which is not true, and because of this nowadays maximum people afraid of FUT. But if a person is in habit of keeping his hair short when he should go for FUE.